Photo Studio Pro (PS Pro) is a photographic exposure control tool for computer generated images. 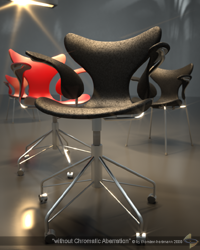 The tool is made of various mentalray shaders that are combined in a phenomenon. This phenomenon is named Photostudio_V2.mi and runs on Maya, 3dsmax, XSI in both 32bit and 64bit. Since Max2008 there is a graphical user interface (gui) with datamanagement. Since 3dsmax2010 Hardwareshading in the viewport is supported. The interface is designed to manage your exposure output. PSPro has some very special features like: realtime exposure or the simulation of the Av/Tv mode of a SLR camera. Loading a dataset will automatically set the parameters for viewport, frame and renderer. Lets you create a Dataset of all the relevant parameters like: exposure, rotoscoping, depth of field, and effects. Mode for the beauty rendering. In this mode a „raw“ preview image named PS.EXR is created and saved in the folder /maps/Photostudio. Turing on this mode for realtime exposure of the „raw“ preview image. You can change the name of a dataset here. Start des Rendering bzw. Update des Effekts ja nach Modus (Button: 4,5,6). Turn 16Bit Frame Buffer on/off. Have you AA-artifacts in 32Bit Frame Buffer, switch to 16Bit. Turn Lens Effect on/off. 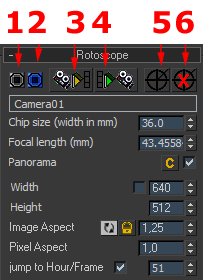 If Lens Effect off, is Panorama Mode and real 3D Depth of Field disable. Click here for easy and direct selection of the camera of the aktiv dataset. Click here for easy and direct selection of the targetcamera of the aktiv dataset. Use this button to copy all relevant data of the selected camera to Photostudio. PS-Pro will read all data of a vray-cam too and will also use this data, because mental ray can render a v-ray camera. Click on this button to copy all the relevant settings from PS-Pro to the selected camera. 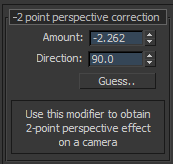 Click on this button to remove the Camera Correction modifier from the selected camera. You set the Chip Size of the camera here. You set the focal length of the camera here. 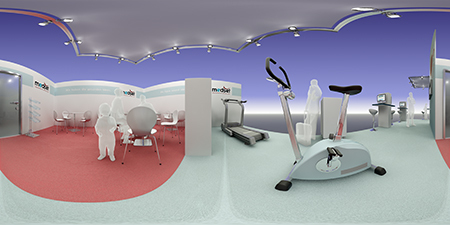 activate Panorama Mode to render 360 degrees Images. Useful Function if you need extra image margins for your renderings – it adjusts your camera and render settings so that your old image will be part of the new rendering without changing perspective. Height of the picture in pixels. Activating this function will set the time/frame to the value that was saved with the Dataset. 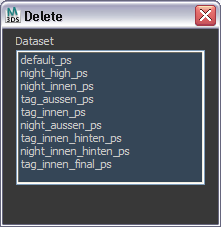 When saving a dataset the current time/frame will be saved. You cant change this value manually. But you just have to set the new time/frame and save a new dataset at that point of time/frame. Set the Framenumber or Daytime of Dataset, to calculate the Exspoure at this time. Swapping between landscape and portrait format. Is this aktive the image aspect will be locked. Here you can access some predefined settings ( Default, Outdoor clear Sky, Night clear Sky, Indoor, night Indoor). Film iso should be the ISO number of the film, also known as Film speed. As mentioned above, if this is zero, the „Arbitrary“ mode is enabled, and all color scaling is then strictly defined by the value of cm2 factor. camera shutter is the camera shutter time expressed as fractional seconds, i.e. the value 100 means a camera shutter of 1/100. This value has no effect in „Arbitrary“ mode. f number is the fractional aperture number, i.e. 11 means aperture „f/11“. Aperture numbers on cameras go in specific standard series, i.e. f/8, f/11, f/16, f/22 etc. 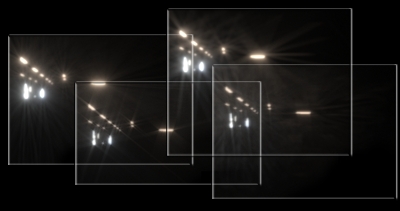 Each of these are refered to as a stop (from the fact that aperture rings on real lenses tend to have physical „clicks“ for these values) and each such stop“ represents halving the amount of light hitting the film per increased stop2. It is important to note that this shader doesn’t count stops“, but actually wants the f-number for that stop. This value has no effect in Arbitrary“ mode. If we use real photographs for rotoscoping those pictures would be double color corrected and would be to dark or to bright. To accommodate for that Photostudio will calculate a inverse energy value. You now have to put this value into the Output-Amount value of the used map. This value is the Av/Tv constant needed to neutralise the double exposure of real Pictures used for rotoscoping. Specifies the main color temperature of the light sources. This is similar to white balance controls on digital cameras. For daylighting, a value of 6500 is recommended, for incandescent lighting, a value of 3700 is recommended. For example, photographs taken indoors might be lit by incandescent lights, which are relatively orange compared to daylight. Defining „white“ as daylight will give unacceptable results when attempting to color-correct a photograph taken with incandescent lighting. Controls the level of the areas of the image whose brightness lies between the highlights and the shadows. Higher values yield brighter midtones, while lower values darken the midtones. When the upper part of the dynamic range becomes compressed it naturally loses some of it’s former contrast, and one often desire to regain some „punch“ in the image by using the crush blacks parameter. When 0, the lower intensity range is linear, but when raised towards 1, a strong to region is added to the transfer curve so that low intensities gets pushed more towards black, but in a gentle (soft) fashion. 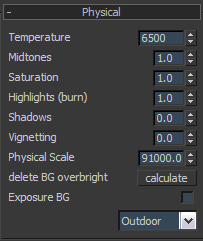 Burn highlights can be considered the parameter defining how much „over exposure“ is allowed. As it is decreased from 1 towards 0, high intensities will be more and more „compressed“ to lower intensities. When it is 0, the compression curve is asymptotic, i.e. an infinite input value maps to white output value, i.e. over-exposure is no longer possible. A good default value is 0.5. The vignetting parameter simulates this. When 0.0, it is off, and higher values cause stronger and stronger darkening around the edges. Note that this effect is based on the cosine of the angle with which the light ray would hit the film plane, and is hence affected by the field-of-view of the camera, and will not work at all for orthographic renderings. A good default is 3.0, which is similar to what a compact camera would generate. Determines how 3ds Max Design calculates pixel values when outputting HDR (high-dynamic-range) images. You can use the physical scale inherent in the scene, or set an arbitrary physical scale for non-physically-based lighting situations. Clicking this button will adjust the physical scale of the exposure. Can be used to avoid that vue or HDRI/OpemEXR images will not be over or under exposed. Click this button to turn on the exposure for the background. Dropdownliste: In this menu you can choose the physical mode (Unit, Indoor, Outdoor, Outerspace). Focal Plane is the distance to the focal plane from the camera, i.e. a point at this distance from the camera is completely in focus. This is an actual measurement in scene units, and for a real-world camera this is approximately the radius of the iris, i.e. it depends on the cameras f-stop. But it is a good rule of thumb to keep it on the order of a couple of centimeters in size (expressed in the current scene units), otherwise the scene may come out unrealistic and be perceived as a minature. Samples defines how many rays are shot. Fewer is faster but grainier, more is slower but smoother. When bias is 1.0, the circle of confusion is sampled as a uniform disk. Lower values push the sample probability towards the center, creating a „softer“ looking DOF effect with a more „misty“ look. Higher values push the sample probability towards the edge, creating a „harder“ looking DOF where bright spots actually resolve as small circles. One can also set the angle with the blade angle parameter, which is expressed such that 0.0 is zero degrees and 1.0 is 360 degrees. When the scene uses motion blur, controls the number of times the material is shaded during each time interval (set by Shutter Duration). Range=0 to 100. Default=5. By default, the material is shaded only once, and then blurred. 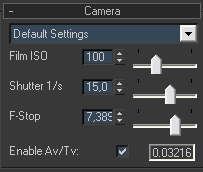 If the material changes rapidly during the shutter interval, it might be useful to increase this value, in order to obtain more accurate motion blur. Rapid changes in reflections or refractions might require a higher Time Samples value. The use bokeh parameter enables the user of a specific bokeh map. When this parameter is used, the parameters bias, blade count and blade angle have no effect. The map defines the shape of the DOF filter kernel, so a lled white circle on a black background is equivalent to the standard blur. 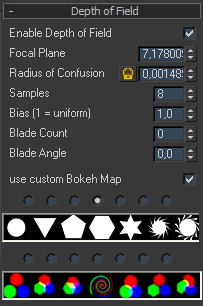 Generally, one need more samples to accurately „resolve“ a custom bokeh map than the built-in bokeh shape, which has an optimal sampling distribution. 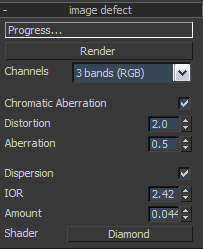 The RGB-Maps is for simulate the „Chromatic Aberration“ effect. When on, the mental ray renderer calculates motion blur. Default=off. When on, use mentalray fast Rasterize (Rabid Motion Blur) algortihmus. Work only in Scanline Mode Default=off. Applies motion blur to all objects, regardless of their object property setting. Default=on. Clicking this button will calculate the shutter speed. This can be helpful when the framerate was changed. Simulates the shutter speed of a camera. At 0.0, there is no motion blurring. The greater the Shutter Duration value, the greater the blurring. Default=0.5. 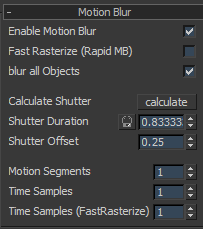 Sets the number of segments for calculating motion blur. This control is for animations. If motion blur appears to be tangential to the actual motion of an object, increase the Motion Segments value. 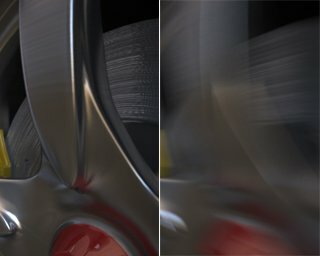 Larger values result in more accurate motion blur, at a cost of rendering time. Default=1. Use Fast Rasterizer is on, the label for this parameter changes to Time Samples (Fast Rasterizer) to indicate that this version of Time Samples is now in effect. The default value for the Fast Rasterizer version of Time Samples is 1, and the range is 1 to 128. If you change the value for either version, 3ds Max Design remembers the changed setting when you switch. Generates an overlay image of the glare effect only; the original underlying image is removed. This mode is useful when render speed is critical, so that Glare can be run on a lower-resolution image to produce an overlay, which you can then composite with a higher-resolution underlying image. Lets you set the tradeoff between detail and speed. 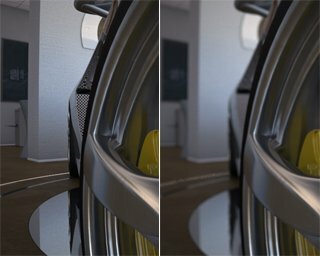 Lower Quality settings cause Glare to run more quickly, but can result in a boxy-looking glare halo, while a higher Quality value gives a better overall effect at the cost of rendering time. A mid-level setting is appropriate for most scenes. Controls how sensitive Glare is to bright objects. Lower values for Spread produce smaller glare halos while higher values cause larger glare halos. Very high values can cause dark objects to have halos. 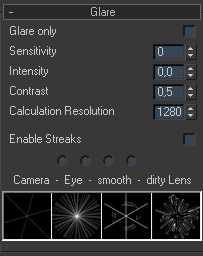 Controls the blending between the „normal“ glare and the streaks image. A value of 0.0 disables streaks, while a value of 1.0 makes the streaks fully visible. An absolute value specifying the image size, in pixels, on which the Glare computation occurs. If you image is rendered at 5000 x 5000 and Resolution for Glare Processing is set to 350, Glare will effectively compute on a 350 x 350 image internally and reapplied on the final image, possibly resulting in an inadeqate glare effect. When on, uses an image file you specify to create a streaking effect, such as is visible when looking at bright images through glass or, in photographs, through a camera lens. Click to choose an image file to be used to create the streak effect. This file takes effect only when Streaks is on. It gives 4 Sreakstypes: Camera, Eye, smooth, dirty Lens. Select the Colorband Mode: 3 Band (RGB) or 6 Band (RYGCBM). The amount of distortion is set here. The Range is from -2 to 2. The amount of IOR is set here. The amount of Dispersion is set here. 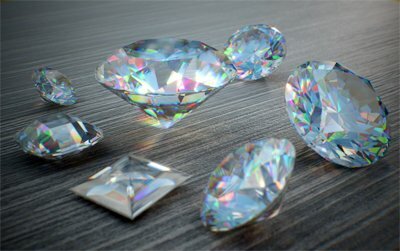 Select a Diamond Shader to calculate the Dispersions Effect. Activate Info in Viewport. In DirectX mode, the viewport requires a full reinitialization for the change to take effect, for example by toggling the maximize view. The buttons will not be drawn unless the mouse is rolled over their location. This can be useful to remove the overlays when creating screenshots of the viewport. You can switch between Standardmaterials or DirectX-Materials. DirectX-Material is better for Viewport Preview Rendering. That work only for A&D Materials. Off / only / composite. AO-Quality: Low / Midle / High. Adjust Sample Radius, increase the value to increase the rendertime. GI-Quality: Low / Midle / High.